The circle around us was slowly tightening. I'm not sure how many pairs of eyes were scrutinising our faces, but there were A LOT. 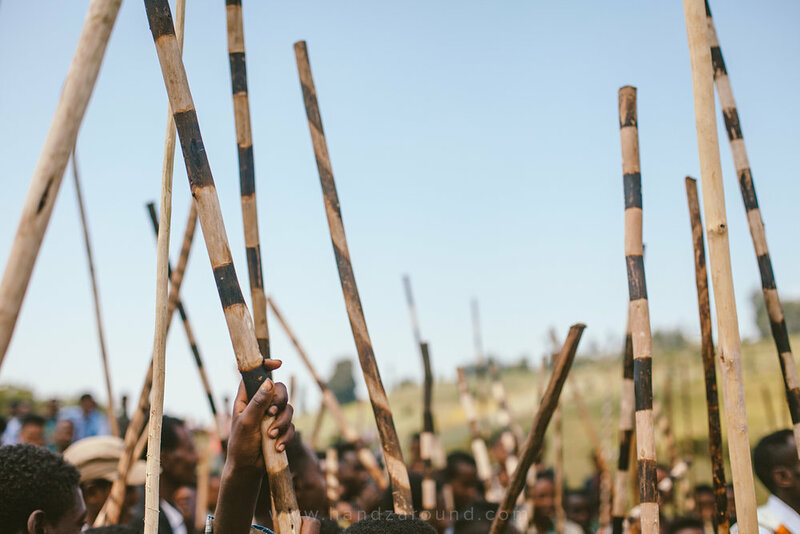 The long bamboo sticks that each boy and man were holding didn't really add to our comfort. 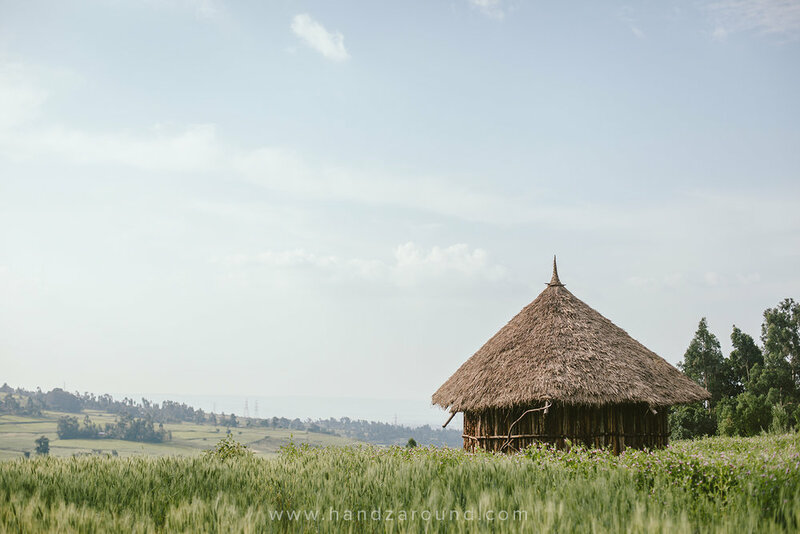 We actually weren't too sure how we would get out of the situation - we were a 30-minute walk down the rolling hills and bushes to the car, and a four hour drive north of Addis. But anyways, what did it matter?! We didn't even have the car keys! Ethiopia consists of 9 different regions and Oromia is one of them. It's the biggest region in the country and Oromo people are the biggest ethnic group in Ethiopia. They speak Oromo dialect, which is different to the official language - Amharic. Century old traditions are very much still practiced in the rural areas of this landlocked country. One of them, performed during special occasions, is the Horse Galloping Ceremony. We were lucky to get an invitation to photograph and film this local event, organised especially for the Meskel Festival. 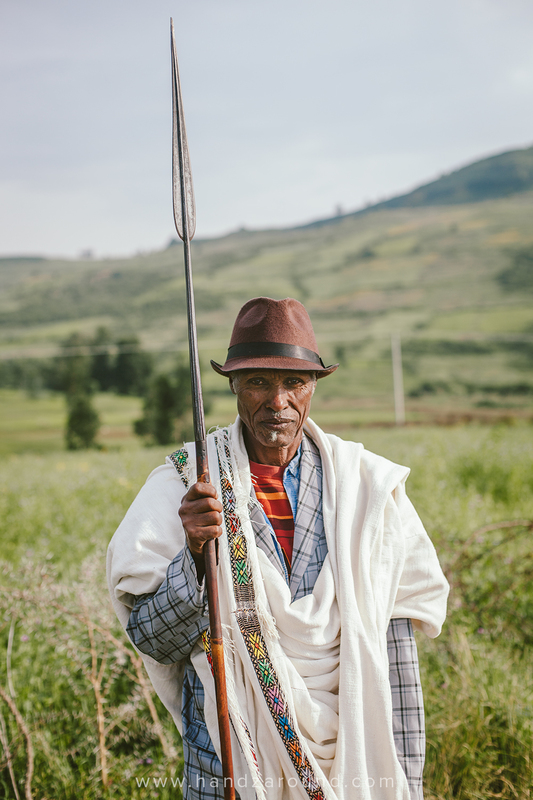 Meskel is an important holiday for Ethiopians - it's the day of finding the true cross and you can read more about it soon on our website. We didn't know what the whole event would look like, where exactly it would happen and what we should expect. We tried finding some information online but all we found was a couple of photographs, no words though! Our ride from Addis started at 7am and we headed towards the town of Fiche. We were told we would drive about 2 hours - we couldn't wait to see everything! We were really excited! Four hours of driving later, we were still 'collecting information' and looking for 'the perfect village'. 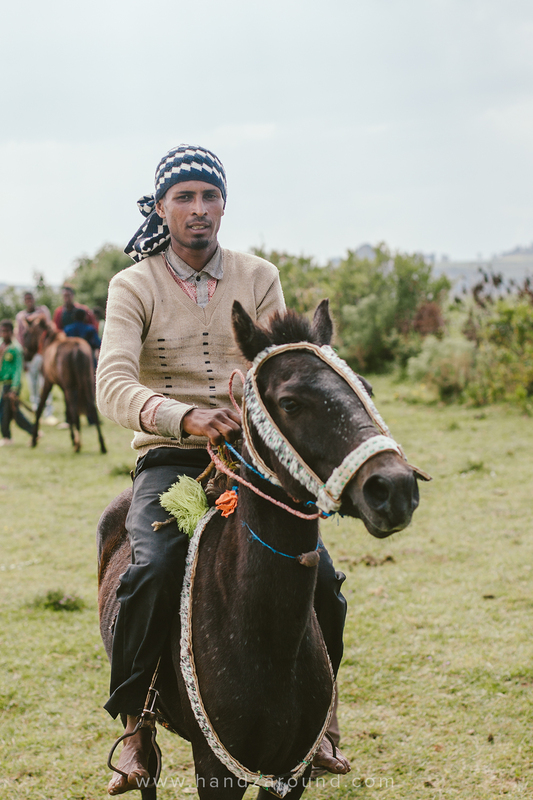 It turned out that the Horse Galloping Ceremony doesn't start until about 1pm and it happens simultaneously across many towns and villages in Oromia Region. Eventually, about 2pm, we reached the chosen village. On the way we saw boys and men with long bamboo sticks walking in the same direction. We got out off the car and had a 30min walk, through the meadows, hills and bushes, ahead of us. A group of about 30 people walked with us, watching our every step. The walk wasn't difficult but because of the altitude our breathing was shallow and quick. There was not a single horse in sight though - we got a bit worried whether the ceremony was actually happening. Finally, half way through the walk uphill, the first horse joined us with its owner. The animal wore a decorative harness and saddle, all very colourful and full of pom-poms flapping in the wind. Zach trying to fly the drone, which turned out to be pretty challenging with everyone staying so close to us. The circle eventually got wider and we had some space! The Horse Galloping Ceremony is organised a couple of times a year for important religious events, weddings or funerals. The tradition is supposed to be centuries old and boys as young as eight or nine already start learning how to ride horses. During the ceremony, the villagers wait for others to arrive from places located up to a few kilometres away. Once the big crowd has gathered, the event starts on the stretch of a flat, green plain of grass. The horse riders either race in duets or quartets, pretend to fight with their bamboo sticks or dance and sing in a circle. Although we were told the whole event has a symbolic meaning, the atmosphere suggested otherwise. The riders, ranging from young boys up to adult men, seemed to use their horses as a background for showing their strength, courage, beauty and pride. They rode their horses bare foot, some of them wearing embroidered traditional capes, whilst their horses were decorated with colourful ribbons, customised harnesses and pompoms. Once the actual horse riding started, we were left feeling puzzled. The main aim of our visit was to document it all, but now we were looking at the men pushing the horses to their limits, striking them with their whips, making them do tricks and violently pulling their reins in all directions. We tried to express to our mediators that we were not feeling comfortable about filming the ceremony - but our concerns were met with vague explanations that everything is 'just fine' and 'it's all cultural'. When our time was nearing to the end, we thanked the villagers (through our mediators) for letting us be there and being able to capture these unique moments. And… that’s where the problems started. Obviously we had no idea what our mediators and elders were talking about, but from their voices and body language it was easy to distinguish that something was not right. Elders were pointing at our cameras and talking back and forth with our mediators, whilst we just stood there having no clue what was going to happen next. The worst thing was that earlier we were ensured by our guides that the locals were informed about our visit and they were more than happy for us to capture the Horse Riding Ceremony. Now it was clear that the guides didn’t tell us the truth. Eventually, after insisting on translating to us what the elders said, it turned out that they were not happy that they didn’t know about our visit because they would have liked to have prepared better for it - put more festive clothes on and prepare a feast for us. We totally understood their position - we felt like idiots invading their land, taking photographs and leaving. We were convinced that if the locals (the young boys in particular) knew we were coming, they would treat us differently, rather than circling us all the time and not letting us out of their eyesight. We had no intention of being the 'main attraction' at a traditional Ethiopian ceremony but that's how it turned out. As unique as the whole event was, we definitely felt uncomfortable and not entirely safe the whole time. It was very intimidating to have our every move watched by at least a hundred boys and young men, the majority whom were all but smiling. It was quite daunting having so many strangers just staring at you. The way the horses were treated was bothering us a lot too, but since we were dependent on our guides, we couldn’t just leave. We understand that it’s a tradition and something the villagers have done for generations, but nevertheless, we felt as if we were supporting something that goes against our views. In the end, that’s what travel is also about - being outside one’s comfort zone. Sometimes travelling is not only about learning new things about the world, but also about learning what you don’t like and what you don’t want to do again. We decided to sum up how we felt in the short film about the Horse Riding Ceremony. What do you think about it all? What would you do in a situation where a centuries old tradition goes against what you believe in? We were able to see the Horse Galloping Ceremony thanks to a local tourism board and office, however we decided not to share their details, since we weren't happy with how everything turned out. All opinions in this article are, as always, our own.